In Dynatrace’s Web Performance division, one of the keys to success was the ability to use NitroAccelerator to help provide real-time performance data to global customers over the internet. Thousands of companies worldwide rely on Dynatrace to optimize the performance, quality, and availability of their web and mobile applications. With over 100,000 networked locations worldwide, Dynatrace faced a challenge providing real-time performance data that it promised its customers. Particularly many of its largest customers are distributed and require performance data to be collected from around the globe. 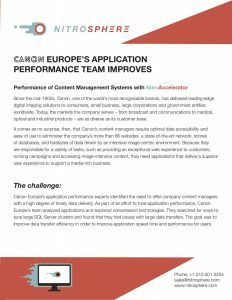 In order to be a real-time solution, they had to improve the ability to push data around the world, no matter the network scenarios. Dynatrace’s performance network relies on SQL Server to house their customers’ performance data. This data is stored geographically local to the websites they monitor and is replicated back to their headquarters using transactional replication. The replication from the remote sites occurs over WAN connections that vary in speed and reliability. These WAN connections in many cases are unable to maintain a real-time flow of performance data. With NitroAccelerator, the Dynatrace team is able to maintain real-time replication across even their slowest WAN connections. 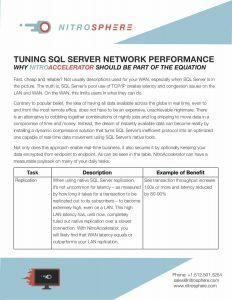 NitroAccelerator provided an 80% reduction in TCP packets and between 80 to 90% reduction in latency.